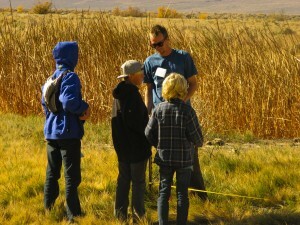 ESWP coordinators believe that docents are the key to the success of the field program. Having docents work with small groups of students allows each child to be actively engaged in hands-on activities, making each student feel included and capable of participating. The ESWP docent corps consists of around 30 community members who have contribute over 150 days annually working with students in the field. Docents come from all walks of life, though many are retired scientists or educators. Volunteering as a docent provides a great service to the youth of Inyo County and exposure to research and monitoring methods used by scientists. Through the docent program, students are able to meet and interact with scientists giving them a peek at what a career in science has to offer.